Wow! It’s been an action packed month and I’m just finally getting back to posting this recipe for this delicious chicken salad that I had started put together in early October. 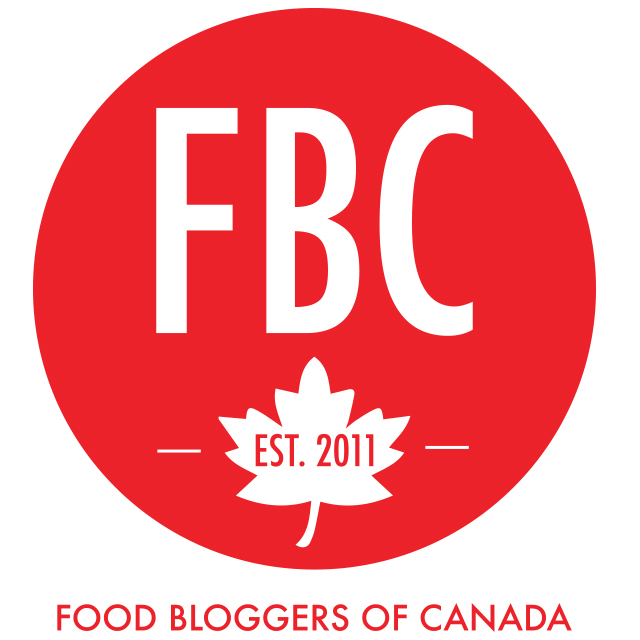 I’ve just returned from two weeks on the road to meet with patients at my naturopathic practice in Calgary, speak at the Food Bloggers of Canada conference in Toronto and to attend Brendon Burchard’s Experts Academy with my husband in Santa Clara, California. It was an exciting whirlwind of travel and meeting new people and it has taken me a few days to settle back into routine now that I’m back at home! Prior to my two weeks away, this chicken salad had become a true staple in our kitchen. My husband and I recently moved from Alberta back to British Columbia and we have been spending our first few months here living in a furnished rental property. Most of our things are still in storage, including the majority of my cookware! Therefore I’ve been sticking to simple recipes that don’t require any fancy ingredients or tools. In early October I made 3 batches of this chicken salad within two weeks and I figure that it’s time I share it with you! Who doesn’t appreciate a simple yet delicious recipe to make packed lunches a breeze? Wow! It’s been an action packed month and I’m just finally getting back to posting this recipe for Supremely Simple Chicken Salad that I had started put together in early October. 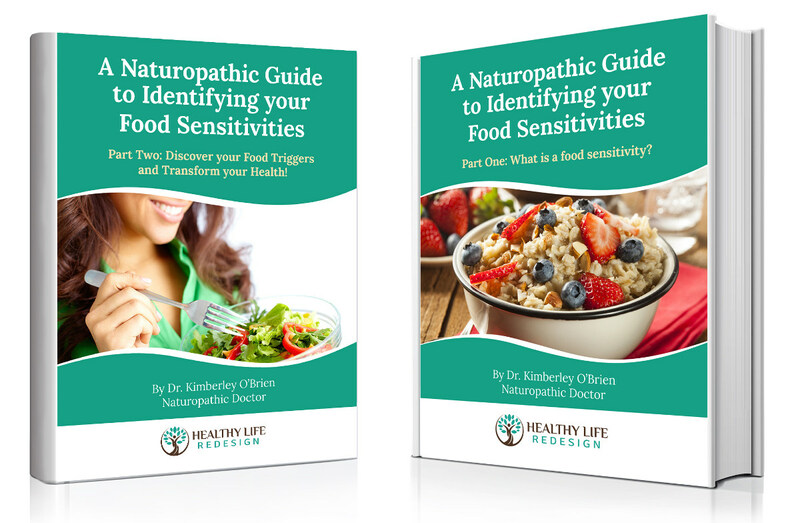 I’ve just returned from two weeks on the road to meet with patients at my naturopathic practice in Calgary, speak at the Food Bloggers of Canada conference in Toronto and to attend Brendon Burchard’s Experts Academy with my husband in Santa Clara, California. It was an exciting whirlwind of travel and meeting new people and it has taken me a few days to settle back into routine now that I’m back at home! 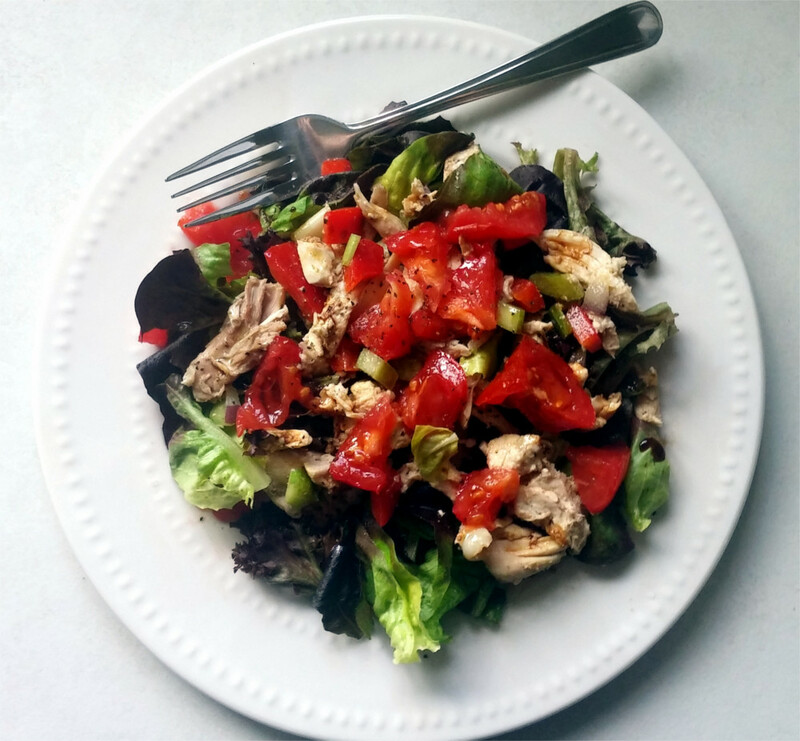 Prior to my two weeks away, this chicken salad had become a true staple in our kitchen. My husband and I recently moved from Alberta back to British Columbia and we have been spending our first few months here living in a furnished rental property. Most of our belongings are still in storage, including the majority of my cookware! Therefore I’ve been sticking to simple recipes that don’t require any fancy ingredients or tools. In early October I made 3 batches of this chicken salad within two weeks and I figure that it’s time I share it with you! Who doesn’t appreciate a simple yet delicious recipe to make lunch and dinner a breeze? This recipe is simple to make and can be thrown together in 15-20 minutes! Depending on your preference, you can either make your own rotisserie or roasted chicken or you can buy one pre-cooked from your local market. As always, I recommend purchasing a free-range, antibiotic-free chicken regardless of whether you purchase it pre-cooked or roast it at home. 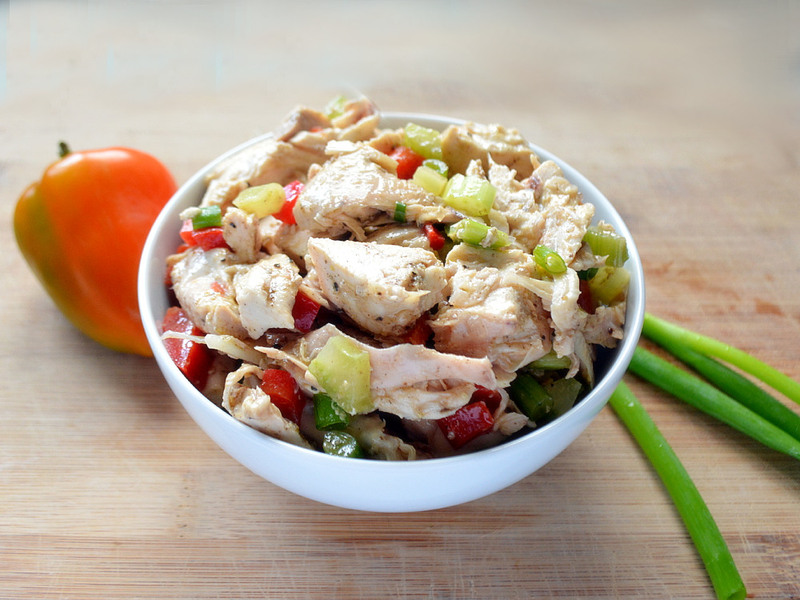 There are several ways to enjoy this Simple Chicken Salad. You can pack it on it’s own as a paleo (grain-free) lunch. Alternatively, it also makes a delicious sandwich when served on your favourite gluten-free or sourdough bread. I don’t have sourdough bread very often, but when I do I find that it’s much less inflammatory than regular gluten-containing breads because the fermentation process helps to break down the proteins (like gluten) that can otherwise cause an immune response. If you’re making a sandwich, I suggest topping it with tomatoes, sprouts, garden-fresh lettuce and avocado. Another option to enjoy this chicken salad is to add a scoop of it to mixed greens and top with your favourite homemade dressing. It’s filling and delicious as-is, but you can also add tomato, sprouts, avocado or other veggies if desired. 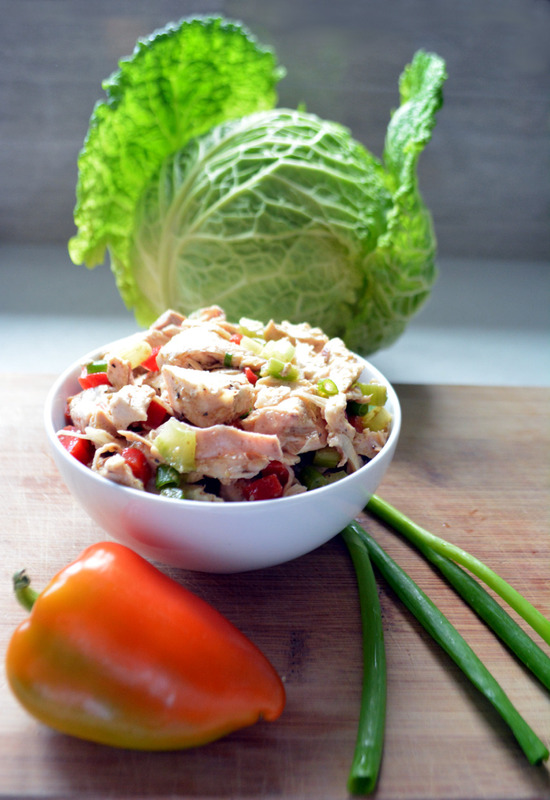 As much as all of these options make for delicious meal ideas, my absolute FAVOURITE way to enjoy this simple chicken salad is to make a wrap using Savoy cabbage. You can also use butter lettuce, romaine lettuce or other greens as your wrap but Savoy cabbage is my favourite because you can pack it full of fillings and it doesn’t easily tear. Instead it stays crisp and it also tastes fresh and delicious! I’ve experimented with toppings and found that adding some shredded carrot, extra Dijon mustard and a drizzle of pickled ginger juice takes this wrap to the next level of tastebud tantalization! You have to try it! As you can see, this one simple recipe can yield multiple different meals and can satisfy a number of different dietary preferences! Let me know your favourite way to enjoy this chicken salad in the comments below! 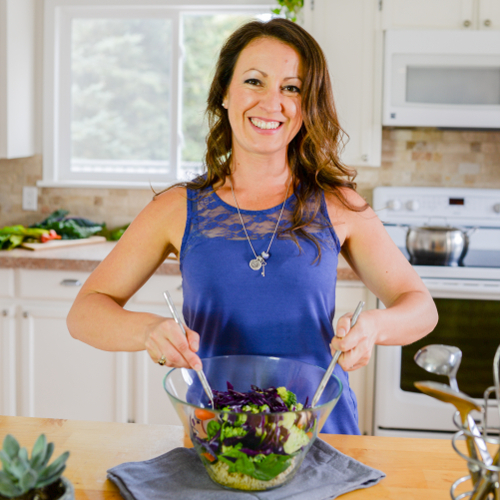 What other healthy recipe staples do you go to when life gets busy? This Dairy-free Dijon Chicken Salad is easy to make and is versatile to enjoy in a variety of ways including in sandwiches, wraps, salads or even on it's own! Enjoy a healthy and delicious lunch or dinner quickly and easily when you have a batch of chicken salad on hand! Remove the skin from the chicken and separate the meat from the bones. This can be done while the chicken is either warm or cold. 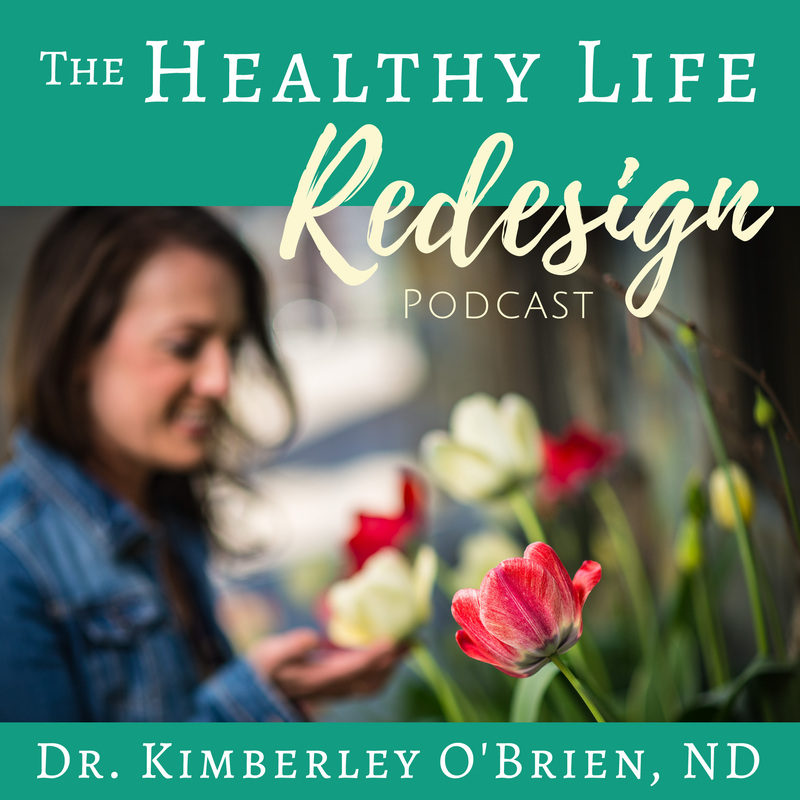 You can discard the skin and may either discard the bones or use them to make a bone broth. Chop the chicken into bite sized pieces and place in a large bowl. Add the chopped red pepper, celery, green onion, mustard, vinegar, oil and spices to the chicken and stir to combine well. Store the chicken salad covered in the fridge for up to a few days. 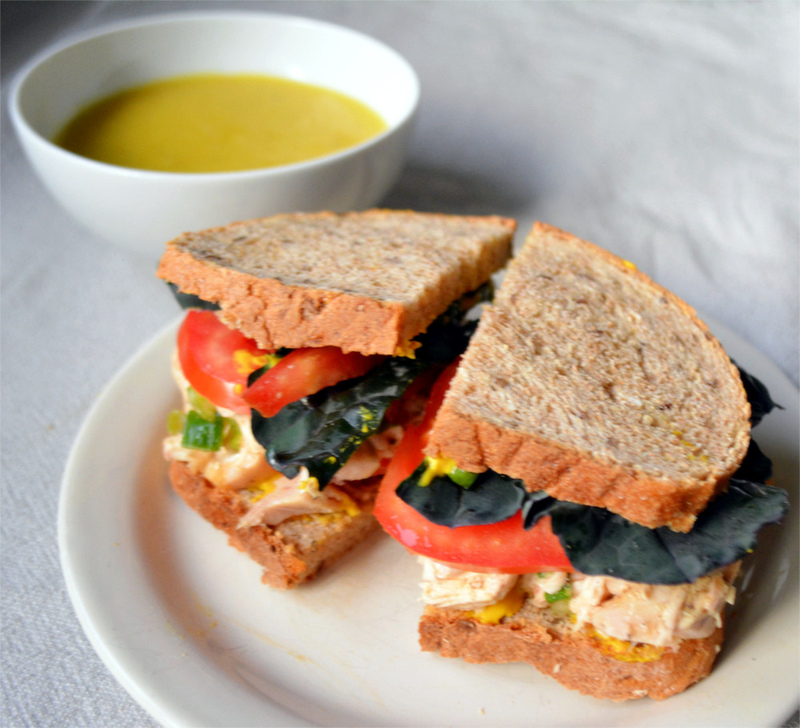 It makes for a delicious sandwich filling as well as a quick and easy salad topping! Thanks for your comment Michelle! Let me know what you think of it when you try it! It’s been a real staple again lately in my home…so quick to throw together and it makes for several easy meals! This is exactly the sort of meal I need when all the holiday baking starts. It sounds like you had a happy whirlwind of activity, but I hope you have time to relax into your new environment now. Agreed! You can also swap the chicken with turkey and use this recipe to finish off holiday leftovers! Thanks Jessica! 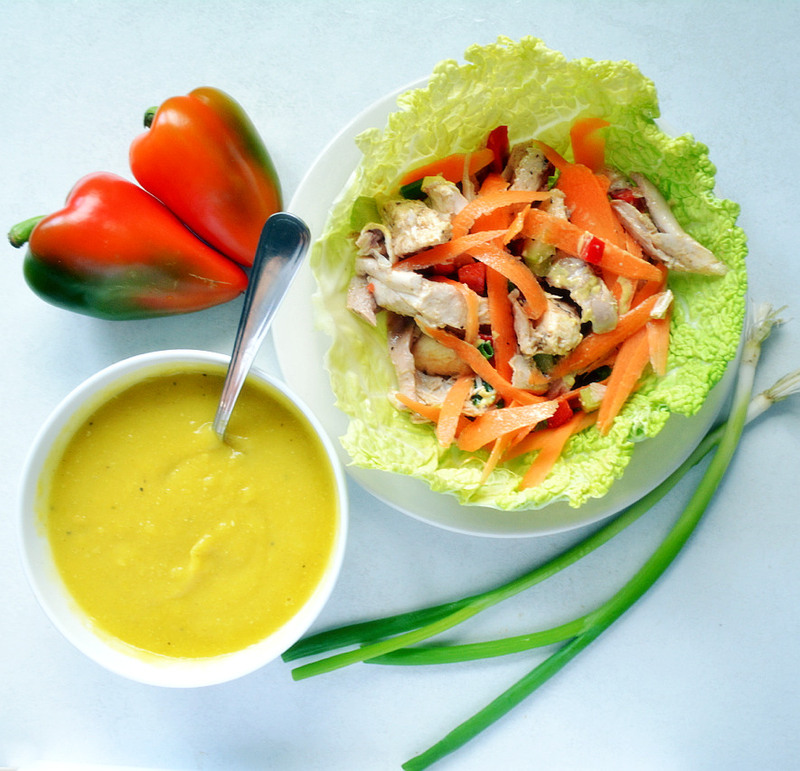 I’m counting down the days 😉 Let me know what you think of the Savoy cabbage wrap!